Let's Take a Shelfie is the fourth stop on the Kill the Father Blog Tour. As part of the tour, I was given the opportunity to participate in a Q&A with the book's author, Sandrone Dazieri. In 1990, aged twenty-six years old and at the lowest point in my career, I was working for a pittance as a cook in a restaurant where the owner’s dogs defecated in the kitchen. My flat had no heating and I had the start of pneumonia. In the boredom of being bed-ridden I asked friends and neighbours to bring me things to read, leading me to collect a pile of dog-eared paperbacks. One of the books that surfaced from that pile had the picture of a typewriter on it and the name of an author I was not very familiar with: Stephen King. It was Misery. As is known, it is the story of the writer Paul Sheldon who, following a car accident, ends up prisoner of a nurse who is in love with his novels: his Number One Fan, as she likes to describe herself. When Annie, the name of his kidnapper, finds out that in his last novel Sheldon “kills” the heroine Misery, she forces him to destroy it and write another in which Misery lives. I’m not going to disclose the ending, but that novel that I read on a feverish night exposed something I had within but which I could not yet give a name or shape to. I realised I too had some form of Annie inside me and that it was so terrible it had completely crushed me. I wanted to write but I was frightened of doing so because my Annie expected masterpieces and my efforts had never met those expectations. Reading Misery, I realised that I was not alone in that war of words, and a week later I quit my job. It was a long journey before I become a professional writer, but started that day. 2. 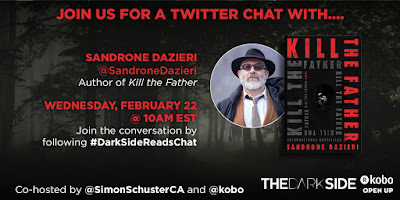 Kill the Father is a very dark and gruesome story, how do you mentally prepare yourself to write about such topics? Castle, the fictional writer hero of the eponymous tv series, always tells that there is two kind of folks who think about killing people on daily bases: serial killers and crime writers… More seriously, I always write of what I fear. So, I can say that it is the writing that helps me survive my nightmares, not the reverse. 3. How does it feel to have your work translated to English and made available for a wider audience? Well, it’s fantastic. I found a magnificent publishing house, Simon&Schuster (Scribner for USA), and a fantastic international team to help me and my job. And I hope to be invited to Canada and meet Wolverine. 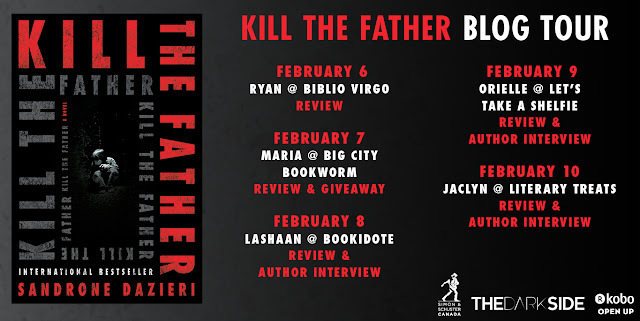 If you haven't had a chance to check out my review of Kill the Father, check it out here. 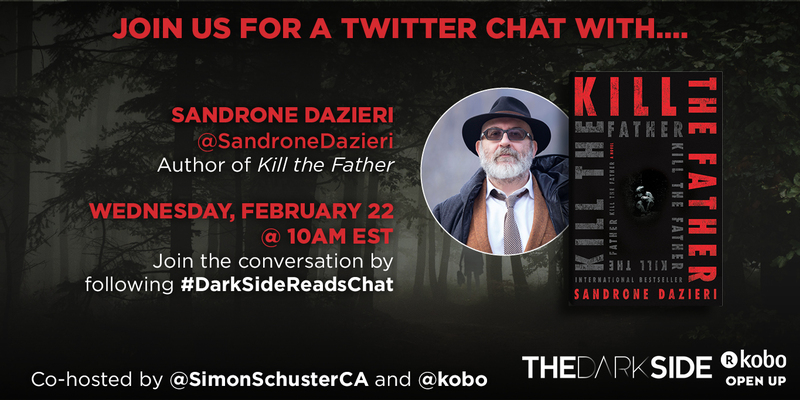 Simon & Schuster will also be hosting a Twitter Chat with Sandrone on Wednesday, February 22 @ 10AM EST. If you've read the book, join in on the conversation and tell us what you loved! If you haven't read the book, follow along to see what all the hype is about. If the responses to my Q&A are any indication of Sandrone Dazieri's personality, we'll definitely be in for a entertaining conversation!